You play as Lone Wolf, the last of the Kai Lords and sole survivor from the Darklords of Helgedad’s attack on your order. After you avenged your allies and defeated your foe, you will now encounter different quests and objectives, while choosing where to go on your map, leading to people who require help, but some decisions cannot be undone. 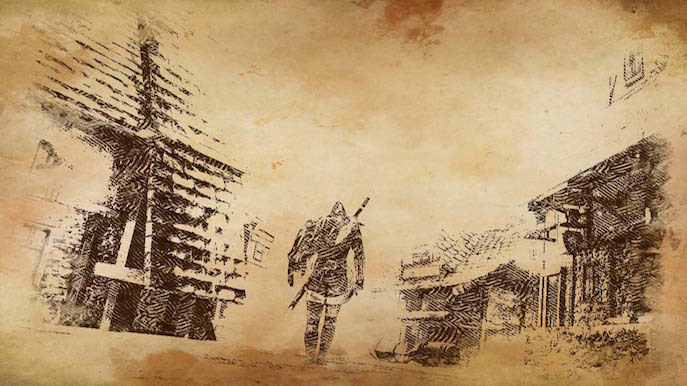 Forge Reply brings us, in collaboration with Plug In Digital and BulkyPix, the HD Remastered version of Joe Dever’s Lone Wolf. 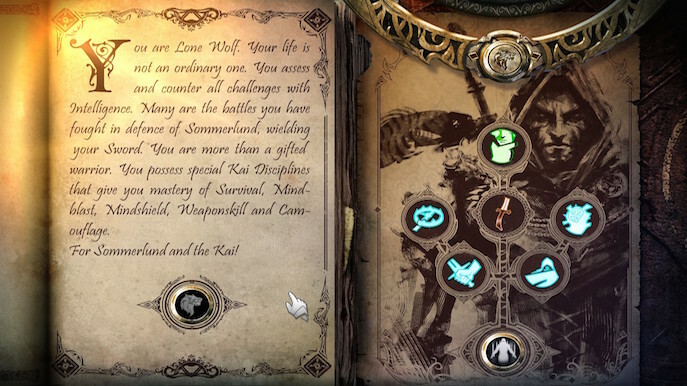 The user interface is divided in two parts, on the left side you have the story that is being written and narrated, while on the right you can choose between looking at your stats, inventory, map, or options menu. 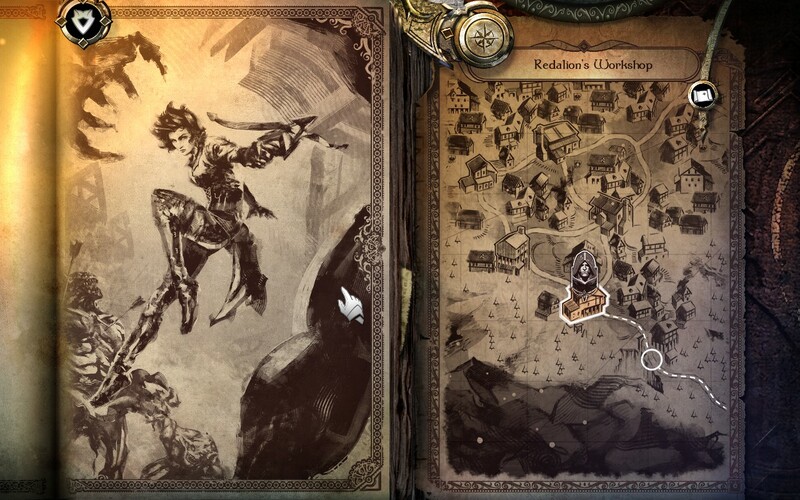 The left side will also show 2D animated parts of the story, while the right side can also be used to show you your decision options when they get triggered. Difficulty settings are interesting; The Easy difficulty will make opponents very weak and will not attack you when the radial menu is opened, but you will not receive special items. 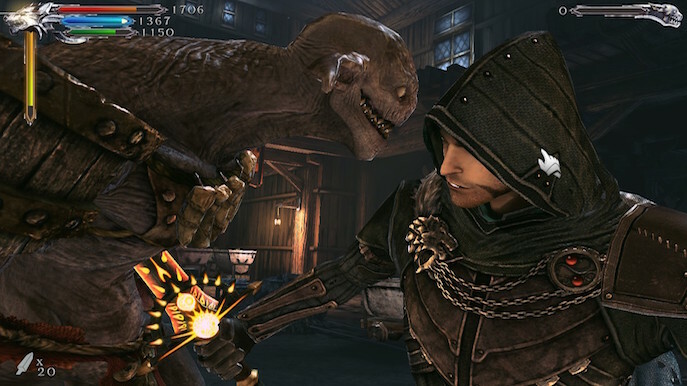 Normal difficulty offers these special items and being attacked while the menu is opened, while the Hard difficulty offers that and more gold. 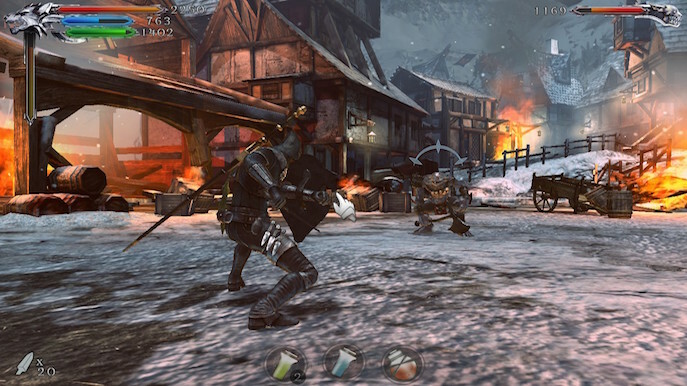 The game offers multiple choices that affect and shape the game as you play it. Every decision you make will be written as your story. Some of these aspects include the way you play the game, being reckless, intuitive, or plan a specific movement. Later you can choose your weapon type, either high damage, quick strikes, or balanced. And finally, your Kai Disciplines, which are basically the sort of powers and tactics you use in combat. There are a very decent amount of tips and tutorials when entering new menus; they are all very self-explanatory and not overly complex at all. Your main status bars are Vitality, Endurance and the Kai powers bar, each being better depending on what sort of character you created. Strength gives you high damage and better armor, Dexterity gives you better dodge and parry and Intelligence gives you better Kai Powers. Use Meditation to rest and recover Vitality Points, Endurance and Kai Power, but only before a new adventure, but you can still be ambushed while on this state, which will cause your Kai powers start on cooldown when the fight ensues. During travelling, random encounters can occur. The inventory allows you to change and equip yourself with the appropriate gear and potions, these are placed in your belt for quick-use during combat, since you can’t access the inventory in this stage or you will get attacked. Most equipment, and yourself, have a very unique render button, which renders the 2D image into a 3D model you can look around, pretty interesting feature. The story in the game is very well written, as it starts strong and generates many questions on what will happen next for your character. A lot of tension and decision making is to occur, and you’re the only catalyst this story has that can make a difference and bring hope to your land. During each situation, you are required to choose an approach, some will trigger an Action Event which you must be ready to do, it’s a fun mechanic that can easily make your adventure easier or harder, the outcome depends on how well you do in them. The story can be very dark at times, for its medieval-like lore imbued with the essence of fantasy. It’s very common for a game like this, and makes for a strong narrative. When playing, the story is mostly automatically written for you, but only the special decisions are yours to decide on how to fulfill them. The biggest concern about this type of game could be its pacing. Some people might look at it as a Visual Novel and could get bored by the amount of reading there is, but fortunately the reading and action events are very well paced, it’s not a boring experience at all once you get into the story. When you have no other choice than to fight, a very well made transition from the book’s paper to the 3D rendered environment happens. You have different ways to attack and use your abilities, but all must be used before the Tactical Time Bar runs out. You can play around with your Off Hand abilities as well; it will define your fighting style but remember to keep an eye out for your Endurance Bar. Most skills are not that expensive to do, but it’s recommended to do well executed strikes. Some abilities will require you to perform a precision Action Event, if timed correctly, you will execute the actions properly, if not, well… Just make sure you do. I personally recommended to start off by applying debuffs to your opponent, it’s always good to start of strong than to wait for an unexpected change In the tide of a battle. Of course, debuffs may also apply to you, but can be cured with specific elixirs. Strikes can also be made by following the arrow with your cursor when it shows up on screen, also you can stay at a defensive stance, and wait for the prompt and dodge the enemies attack while at the same time perform a counter. When your enemy is low on health, you can choose to perform a killing blow move by pressing on the Wolf Icon near the enemy. When defeating your foe, you gain loot! 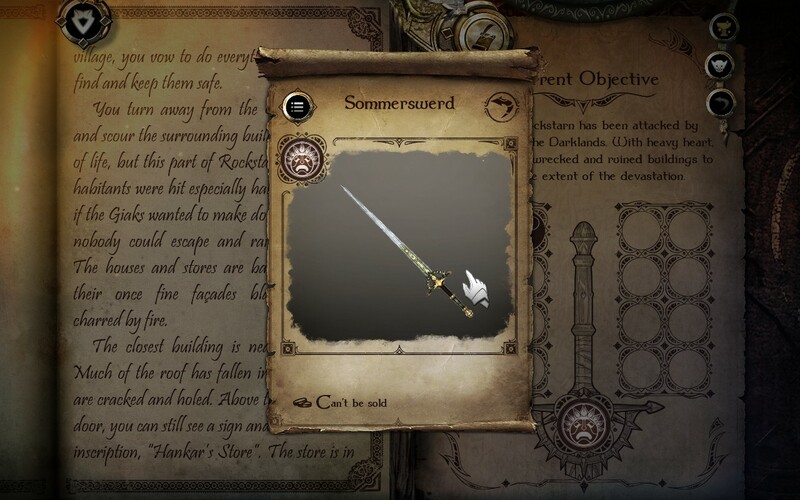 It varies between potions, new equipment and materials for upgrading purposes, as well as Gold Crowns (the currency). 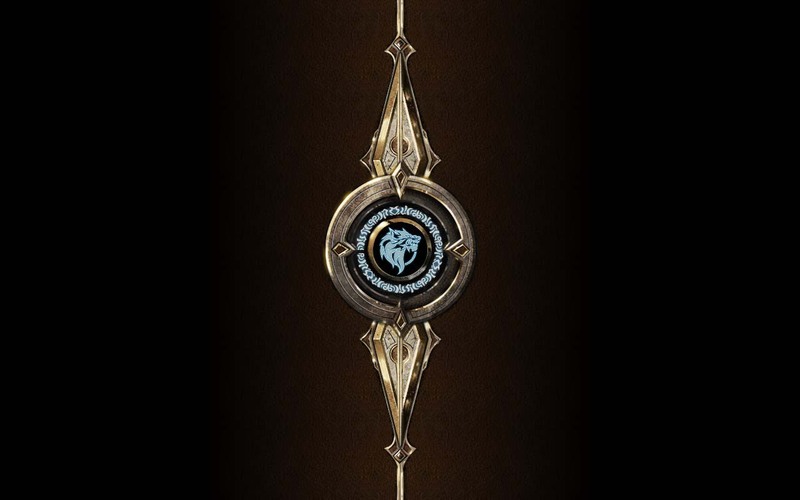 Sometimes, during your adventure, you will find chests than can be lock picked, if you are familiar with Skyrim’s lock picking system, it’s pretty similar but here you have to use a knife to force open it, but not at the same time as the pick, this will make the lock to start rotating, eventually you will find a good spot and be able to open it. A good tip is to move the lock pick until it sounds louder than the other movements, than when you can safely push the knife to the left until it opens. Usually you will find goods stored in chests that can really help you out if you ran low after a struggling battle. At times you will encounter new characters that will interact with you, depending on how they approach to you, you can decide how to answer to them, either being rough, gentle, or diplomatic. You never know who will become an issue, or who will become a formidable ally. The strongest aspect of this game in my opinion is their implementation of an old yellow paper with the 3D environment and character models, these transitions are spot on and look really good. The character designs are somewhat generic in some aspects but overall interesting. The animations and special effects have a very similar feel to some Final Fantasy games, in the terms of turn based action and the damage numbers on targets. They are quite fluid and mostly original and unique depending on whom you fight against. Unfortunately, if you don’t change your playstyle you will get stuck looking at the same animations. The color palette works around the dark fantasy ambience, but probably a tiny but too bright. Overall I would say their aim to bringing a written story to life has been successful, and in very clever ways. The epic fantasy tone given by the soundtrack works quite well, and it crossfades quite decently between encounters while you read the story (which is very important, you don’t want to distract the reader). The mixing includes well panned instruments and reverbed voices chanting with the rhythm. A very common sort of soundtrack but well made for this type of game. The sound FX are ok, nothing quite impressive done with them really, they simply work well enough to not take you out of the narrative. 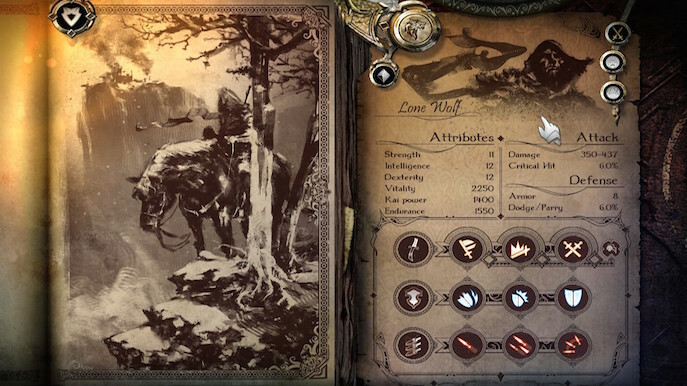 Joe Dever’s Lone Wolf, the HD Remaster is probably one of the best games I’ve played in terms of transforming an epic story into something you can play, something you can be a part of and choose a branch to define your character within it. Highly suggested title for fans of the genre and it’s gameplay mechanics. You are the author of this story; you decide your role and your choices.